Dear Teachers - Happy Teachers Day. 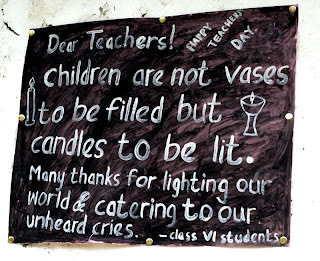 Children are not vases to be filled but candles to be lit. Many thanks for lighting our world and catering to our unheard cries. 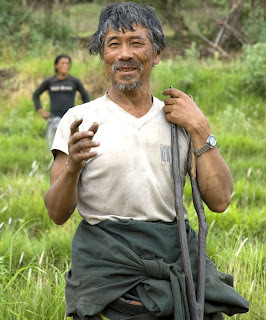 And you will see directly above the principal of the school, Mr. Dorji. Mr. Dorji kindly provided me with the following mission statement for the school. To provide a caring, happy secure and purposeful educational setting. Marketable students in the world of work. Promote good relationship and discipline based on mutual respect and understanding. Establish an education culture that will make meaning to each and ever students life. 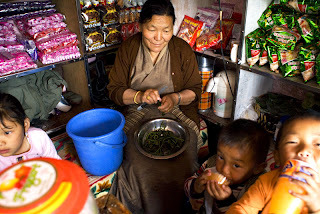 Promote core value and ethics of Bhutanese society. 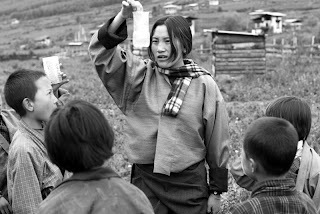 A statement, I would say, that represents well the perspective of Gross National Happiness. 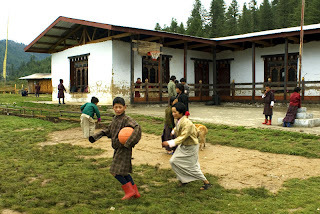 The same game playing before school as at the primary school occured at the middle school. Kids arrive early to play games before class. This has an interesting corrolation to Gross National Happiness. A number of adults when asked what makes you happy? replied: playing games. 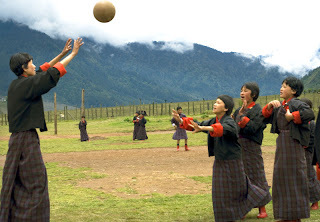 The preservation of Bhutanese culture is, in part, the preservation of the joy found in playing games. Gantay, as aforementioned, is a remote settlement high in the Himalayas. The route to Gantay is long and, to my way of thinking, treacherous. In such a location internet reception is possible but, by no means probable. The reception is dial up and, as telephone service is not yet reliable, internet connection is at best a sometime thing. Knowing this, you can imagine the excitement when one of the teachers at the Gantay Middle School brought a laptop to school. It was definitely a draw for the red booted boys. What are the red booted boys looking at? Stay tuned! Here are some children from the Gantay Middle School, which we will look at tomorrow. 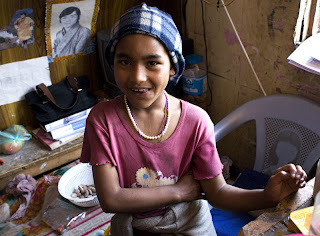 The girl is wearing the expensive beads belonging to her family. I think it must be a real honor, a special occasion, for a girl to have a chance to wear the beads. 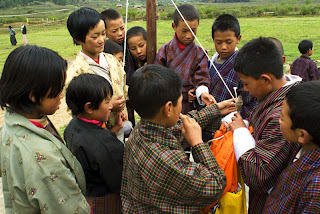 An impressive aspect of the committment to education in Bhutan is the project, now in it's nascent stages, in collaboration with Teton Science Schools ( Journeys School is a wing of TSS). 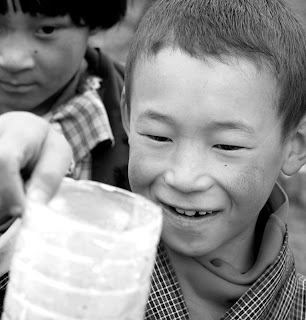 This project is aimed at bringing place based education to the science taught in the Bhutanese schools. The above collection of rain water in one of the classes at Gantay Primary would be amplified and enhanced by this project. The point of view of place based education is voiced well in a caption in the Journeys School pictures: why read about a worm when you can hold one? 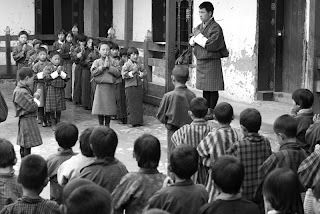 Each school day at Gantay Primary, as with all schools in Bhutan, begins with an assembly presided over by the school principal. The children line up in preordained rows, boys and girls separate. A prayer with all students participating is the first thing that occurs. At each school, a student or several students present a spoken presentation. In the primary school and middle school the pricipal or a teacher then positively critiques the presenter ( s). Announcements are made and, if a guest is present, he or she is asked to speak. This she, when asked to speak was unprepared and relied on that old trick: open your mouth and see what comes out. 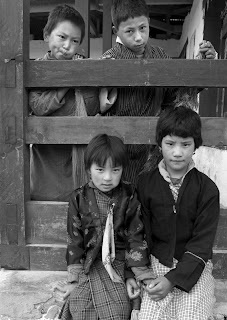 I am not really sure just what did come out but, as Bhutanese children are polite and mannerly before visiting elders, it didnt seem to matter. Or so I choose to think. Trying out a bit of black and white from the Gantay Primary photos. Hope you can see the expressions of the boys. They indicate to me that little boys all over the planet are basically one organism. I arrived at Gantay primary early before the teachers and principal and so did, from all appearances, all of the children. 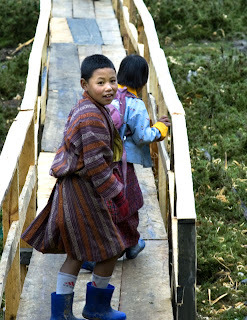 Arriving entirely by foot and many from great distances, the children crossed a newly built little bridge over a wet land in their proper outfits and rubber boots to get to the school. Gantay is high in the Himalayian clouds and, at this time of early monsoon, already pretty wet. At that time before assembly, there were several unsupervised activities going on at once - hopscotch, rock toss, ball games and what Journeys School would call "hands to work", that is, sweeping, picking up litter and emptying the water barrel. It was impressive, needless to say, that this "hands to work" had no monitors and was all done quietly and efficiently. I was to see this at the other schools, both higher levels, as well. 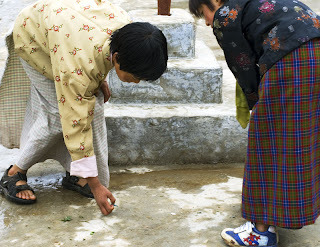 Self discipline and responsibility appear to be clear priorities in the Bhutanese schools. You cannot see it in this size photo but in the third picture down the girl is picking up bit of trash so tiny that you or I might fail to even see it. In the above picture the girls are moving the water along after a group of little boys had emptied the barrel of water collected over night into the small gutter. The first of the three schools I visited was Gantay Primary in the beautiful high valley of Gantay. Above is the flag raising event that takes place before assembly every morning. Gangtey is an incredibly beautiful, hidden almost magical place so it was a real treat to have my first school visit there. More on this school to follow. To the point below, I recently read in a paper by Frank Dixon, www.globalsystemchange.com/GSC/Articles.htlm, " Complexity ( of measuring GNH ) will be ...... increased by the likely need to develop alternative means of measuring success. Literacy and education provide good examples of this. 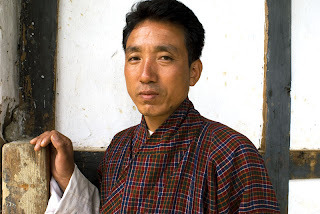 Illiteracy is high in Bhutan*. This would be seen as bad from a Western perspective. 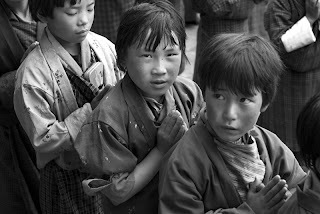 However, Bhutanese children may be far better educated on the most important aspects of life than American children. 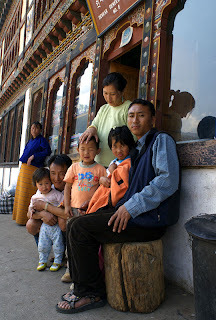 Bhutanese children spend much more time with their parents. In doing so, they learn cultural values, social skills, and the agricultural and other skills needed to sustain them over their lives. * this foot note is mine. 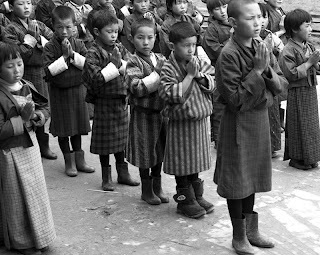 The committment to education is most impressive in Bhutan, however daunting the terrain and the relative nascent stages of the system. More on education ( and more adorable children!) will follow. 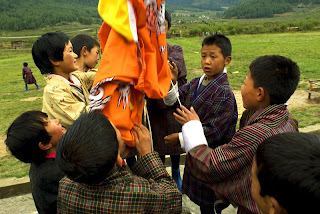 There are no child care centers in Bhutan. ( I cant verify but was told this and it surely appeared to be so ). 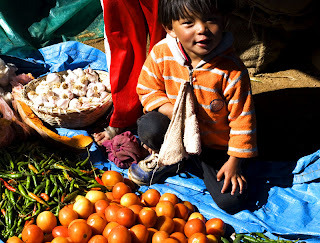 One of the things that struck me over and over in Bhutan was that the children were out in the fields or in shops or at the market with one or both of their parents as the parents worked. The children that I saw were never demanding attention, pouting or whining. I imagine this sounds like some sort of blind eyed vision on my part but, truly, I only saw contented children. They were not ignored by their parents, not at all, but never seemed to interfere with the work at hand either. 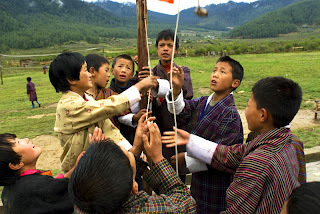 It occurs to me that, while the educational system of Bhutan being in its very early stages cannot be compared to that of developed countries, there is a kind of familial learning in Bhutan that is lacking in the western world. 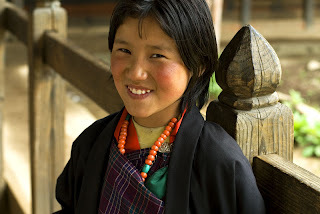 Bhutanese children are with their parents, grandparents, aunts and uncles much more than than American children are. I think of the skills being learned in the pictures above as hard, perhaps, to measure - no As or Fs or pass, fail - but as equally life enhancing as,say, geometry and french. 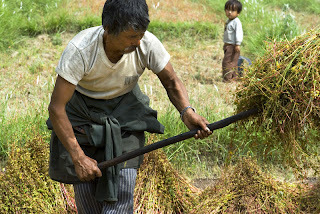 In the field described below, I encountered a father and his grown daughter harvesting and threshing barley. The harvest would be their family's supply of barely grain for the winter. 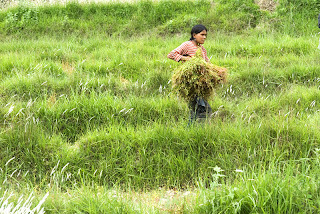 I had never seen threshing before or, if I have, it was certainly not by hand. 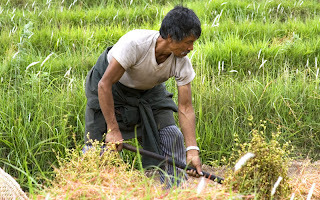 As the woman collected the barley and placed it on a woven mat, the man threshed the barley with the stick that you see, separating the grain from the shaft. I was stunned by the amount of effort he had to put into this process in order to gain a handful of seeds. 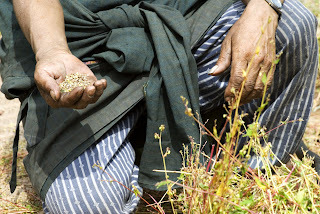 The connection to the earth and it's bounty is something that few of us westerners know so intimately as these people do. The truth is, I wasn't all that certain at the time just what barley is used for. ( Ah! "John Barley Corn" but also breakfast food and stock feed ) Most likely few of us would want to change places with farmers as these - till the soil, harvest and thresh, pound into grain. Still I couldn't help wondering what unimagined benefits lay hidden in such a process. 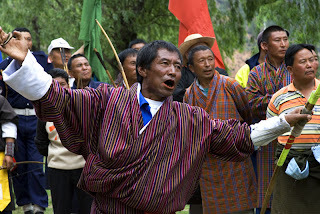 The people of Bhutan are closely connected to the land. 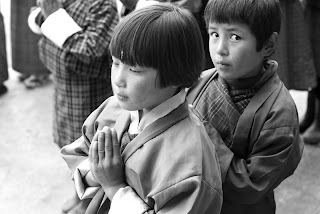 In this, the culture's social customs and values as well as it's collective belief in folk wisdom enhance GNH's conservative, respectful view of the land. The land is also the source of sustance and economy. 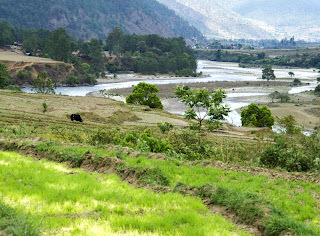 I cannot give you solid, impressive facts about farming in Bhutan but I can tell you about the field above that was directly beyond my hotel in Punakha. What you see in the picture directly above is perhaps a fourth of an enormous field that was in various stages of cultivation at the time. There were no fences but it was clear that this land belonged to several different families. 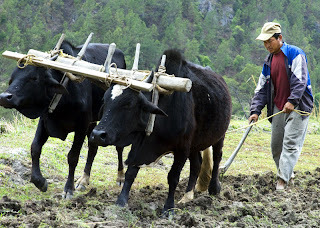 The first people I met there were the men plowing rows behind the oxen. 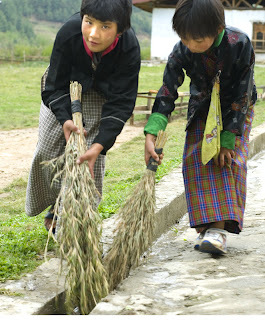 I was in Punakha at the very earliest stages of the summer monsoon and the soil was moist. The men walked steadily behind these formidable animals through the muddy rows in bare feet. 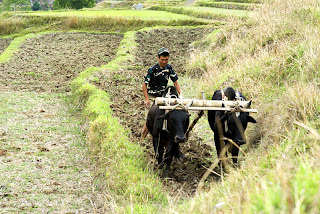 Beyond the various rows being plowed, the above young man moved staked calves and cows from one part of the field to another. I am not sure of the purposeof this way but I think it may have been a clearing process prior to plowing. The brignt green rows in the picture of the field above are of barely. 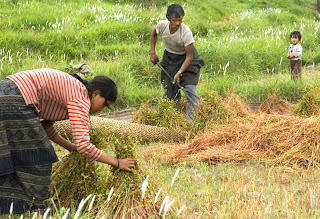 The barely was being harvested by the man in the top picture and his daughter. It is this family that I will tell you about tomorrow. Oh, in case you are wondering, there is no zoom lens at use in picture #2! 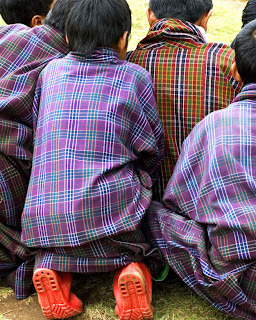 One of the pillars of GNH is preservation of the Bhutanese culture. 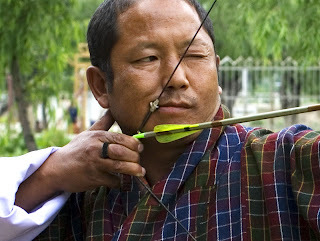 Archery, being hands down the most popular sport, is most definitely a cherished part of the culture of Bhutan. 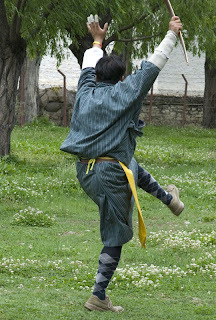 It is played with bamboo bows and arrows as well as more contempary metal equipment. 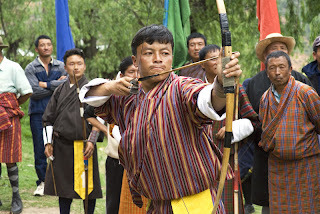 The latter are imported and expensive and it appears, as in this competition, that the real purists are committed to the Bhutanese bows. You will see above that the targets are placed incredibly far apart - 140 meters or 153.16 yards. Surely the celebratory dances emanated from the degree of luck mixed with skill needed to score points from such a distance. 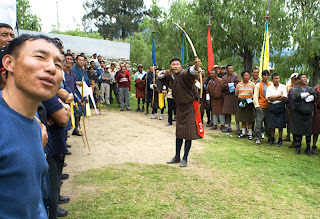 There is a good bit of celebratory drinking as well and, as arrows can go astray and as there can be injuries ( like, um, death ), I consider myself, just by being a spectator at one event, definitely worthy of an "I survived a Bhutanese archery competition " tee shirt. No such silly tourist item exists in Bhutan. Darnnit. 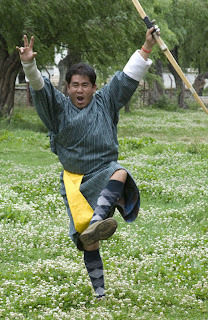 The aforementioned happiness relative to archery in Bhutan is evident here. Actually a spritely, over the top dance of exuberance is not just the manifestation of this archer's joy at a point scored but what every archer does when a score is made. When a the team of four archers wins a set, all four men dance. 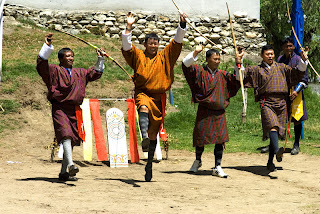 More on that tomorrow and why you might dance as well if you hit a bullseye in a Bhutanese competition of tsechu ( archery). When I asked my friend, Tobgay, ( above): what makes you happy? His immediate reply was: ARCHERY! 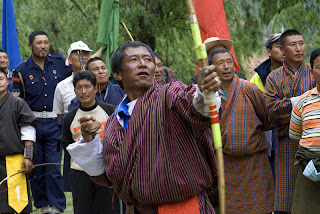 There is no question that archery is the most popluar sport in Bhutan. And it is huge! I was told that divorces can occur because of it. 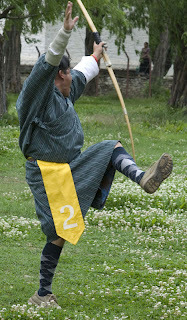 At most times of the day you can find men playing archery on the large field in the center of Thimphu. Despite the seriousness of the committment, it seems to be an enourmously good humoured sport. I can't think of a similar bit of game playing in the west with so much happiness. 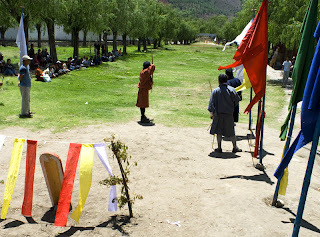 I was fortunate in being able to see a national semi finals game in Paro. Pictures and words about this will follow!